Baking up a customized solution. Serving up fair foods that stand out. The little things we do make things easier for you. At Fischer Paper Products, we take care of the little things. Like responding quickly when you need help, offering flexible and custom shipping options, and delivering an error-free order on the date we promised, no matter what. Our attention to detail—and to you—is the reason most Fischer clients are Fischer clients for life. of Fischer deliveries arrive on time or earlier. is an SQF Level 2 rating that Fischer is proud of - and makes us GFSI certified! Fischer relationships have lasted for more than 20 years. The right solution, right away. Trust three generations of Fischer pinch-bottom expertise to help you find, customize and even create the perfect, high-performance fit for your packaging and supply chain needs. Learn more. Browse hundreds of our customizable and ready-to-ship paper bags, wraps and more. Need a quote? Our team usually delivers in 48 hours or less. The Challenge: Chabaso Bakery wanted to make their bagged breads more visible for retail sale. Often stored on their sides and on shelves, their delicious, unique breads were tough to identify and didn't provide a lot of visual appeal. So, the growing bakery came to us with a challenge: How do we make it easier for everyone on both sides of the counter to see the fantastic bread hidden inside the bag? Chabaso Bakery bags with window panels show off the breads inside. Introducing two new stock items! Two sizes of our french fry bag with grease resistant natural kraft paper are available now. In this age of transparency, environmental sustainability is becoming a way of business. Consumers associate brown kraft with "eco-friendly" and are taking note of those who offer natural kraft options. Branded under the new line "Fischer TruKraft™", these bags are sure to keep your customer's hands clean while promoting sustainability. 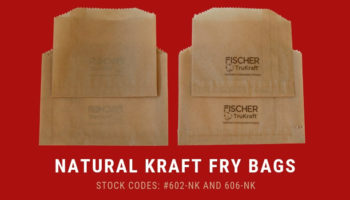 Get more info: Fischer TruKraft™ Fry Bags. As a manufacturer, Fischer Paper is committed to creating the perfect paper packaging for each of our customers. However, packaging can be complex. Sometimes, the best packaging has to be a mix and balance of different elements. In our latest white paper, we explore the current consumer needs that are most important when it comes to packaging. To read the white paper, follow this link. Fischer is now offering a brand new glassine paper. 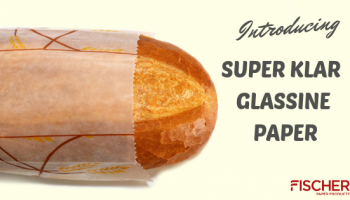 "Super Klar" is a new type of glassine that is lightweight, pure, breathable and naturally grease-proof. It is also more transparent than the standard glassine. Like all of our glassine products, the new, premium glassine is biodegradable and compostable which makes it an ideal material for those trying to improve sustainable initiatives. Minimum order for this sheet is 5000# with floor-stock option. Caring about the little things. It's a Fischer tradition that's three generations, and more than 40 years, strong. Our exceptional service and commitment to perfection make packaging easy, so you can focus on selling more of what goes inside of our top-of-the-line paper products instead. 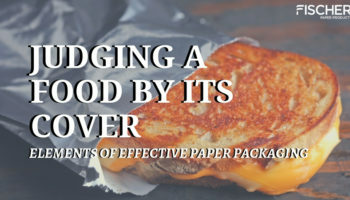 © 2019 Fischer Paper Products, Inc.